For some reason, many people believe that it is forbidden to wear clothing that contains mixtures of different fibers. However, the Torah does forbid us to mix linen and wool in our clothes. And wool refers specifically to the wool of sheep, lamb and rams. Other fibers, however, are absolutely permitted. Many fabrics today have mixed fibers and are not 100% any particular one material, and this is usually permitted, unless wool and linen (or wool products and linen products) are mixed. Nothing at all is forbidden in clothing mixtures except wool and linen mixed together. As it says in the Torah (Deuteronomy 22:11): Do not wear shaatnez, wool and linen together. In other words, the Rambam is saying that the Torah states explicitly that shaatnez is wool and linen together, and not any other mixture. Any other mixture in clothing is permissible. The Torah, as we see, is rather clear that shatnez refers specifically and only to wool and linen. The great Rabbinic Commentator Rashi says (on Genesis 26:5), quoting the Midrash, that the Law of shatnez is a chok, a decree that the King has passed for His subjects, for which we do not know the reason. A great many of the Commandments in the Torah are of that sort. We do not know precisely why pork is forbidden, for example. We do not understand how the Purification by means of a red heifer works. Therefore, we can never truly understand the entire reason for this Mitzvah, but we can understand some of the concepts within it, at some level. Maimonides, in his Guide to the Perplexed, points out that ancient pagan priests used to wear wool and linen processed together, because they knew how to make use of it for occult practices, including idol worship and other terrible things, and therefore the Torah forbade us to use it for all time, and ordered us to stay far away from shatnez, as well as all other practices of the pagans. Wool and linen attached to each other by any means is forbidden. It does not matter whether they are sewn together, spun, twisted, glued, or any method of attaching whatsoever. Any method of combining wool and linen is forbidden. Wool that has linen thread through it, linen that has woolen thread through it, wool and linen fabric sewn together by silk (or any type of thread), wool or linen held together by a needle or pin — all these are forbidden. However, it is permitted to wear a linen garment over a woolen garment, or vice versa, since they are not attached to each other. Even the smallest amount is forbidden. For example, if you have a wool suit and the label is sewn on with a linen thread, it is forbidden to wear the suit until the linen thread is removed. You may not wear a wool jacket with a linen patch on the elbow, or anywhere else. The prohibition of shatnez applies to any sort of material, whether it be used for socks, shoes, gloves, pajamas, etc., and to any period of time, no matter how brief. We may not even try on clothing that has shatnez to see if it fits. All suits and winter coats should be checked for Shatnez no matter what the label says. Even 100% synthetic suits have been found to contain Shatnez. Similarly, all «linen look» fabrics, (recognizable by the thick and thin thread appearance, just like linen) should be checked. Clothing that lists wool, linen (flax) or even the slightest quantity of unidentified «other fibers» (O.F.) on the label should be checked. Since one of the two forbidden fibers is already present, the odds of finding Shatnez increase greatly. Recently, some Italian and Spanish ties whose labels cited only silk and linen turned out to have wool in them as well, and so they are shatnez. Avoid reprocessed or recycled materials. Avoid Appliques — especially on sweaters and children’s clothing. If Shatnez is found in a garment and the Shatnez is removed, it becomes permitted to wear the garment. It is forbidden to wear shatnez even if your body doesn’t touch the material, and even if you get no personal pleasure from it. Even if it does not warm you, or make you feel better in any way, it is still forbidden. So if you wear only the part that has no shatnez, and you let the part with the shatnez dangle and not touch you, you are still transgressing the Mitzvah. It is also forbidden to dress another Jew, even a baby, with shatnez. If you discover you are wearing shatnez, you are required to immediately remove it — unless you are in a synagogue. Then you should wait until the end of the prayers or the learning session or some time that it is okay to get up and leave, and then go out and remove the article of clothing. A dealer, storeowner, or salesperson, may sell shatnez fabric or clothing, but not if there is any possibility that a Jew might wind up wearing it. That means you may not sell it even to a Gentile if there is a possibility that he might give or sell it to a Jew. Don’t make light of this prohibition. This is one of the Mitzvos of the Torah, and it applies at all times and to all Jews, male or female. The same Torah that forbids us to eat pork forbids us to wear shatnez. It is equally as bad to wear shatnez as it is to eat milk and meat together. There is a common misconception that no one keeps this Law today. That is absolutely incorrect. This Law is in force today, and we are required today to keep it just as we were required to keep it for the past three thousand, three hundred (etc.) years since the Torah was given. Today, just as in the past, all those who desire to keep the Mitzvos of the Torah are careful not to wear shatnez. This is almost as widespread among Jews as keeping kosher. Jewish men and women all over the world keep this Mitzvah. So How Do We Keep This In This Day and Age? The mixing of wool and linen in mass-produced clothing is much more prevalent than you would think. For this reason Shatnez laboratories have been set up throughout America and Israel, and many other parts of the world. 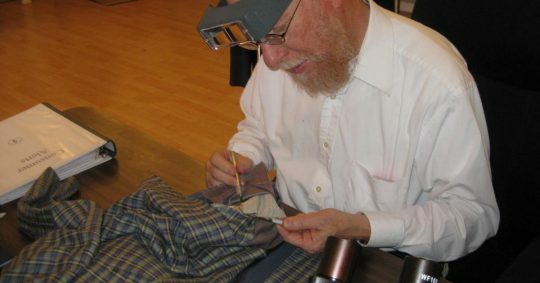 Clothing stores owned by religious Jews often have regular visits by their representatives, who test the clothing, and place on them special seals. My suits all have them, or I don’t buy them. Plus you can take your clothing to a Shatnez Laboratory where they will check your clothing for you, for a small fee. When you buy a garment, you cannot rely on anyone’s opinion, and you can’t even rely on the manufacturer’s label. Manufacturers are not required by law to reveal every element in their clothing. Even if a garment says 100% wool, it may legally still contain linen threads, and these need not be mentioned by law. In addition, United States government regulations allow a manufacturer to write «100% wool» or «100% synthetic materials,» even if 2% of the garment is made up of other materials. Yet by Jewish Law any amount makes it shatnez (Shulchan Aruch, Yoreh Deah 299:4). Therefore even clothes made of synthetic materials may need checking. However, there are definitely types of clothing that do not need to be checked, as I mentioned above. To find out which of your clothing needs to be checked, and/or to have your clothing checked, call the National Committee of Shatnez Testers, in the United States or Canada, at 800-SHATNES (800-742-8637), from 2:00 PM until 5:00 PM and after 8:00 PM, Eastern Standard Time, Sundays through Thursdays. In Israel, call either (02) 654-0928, in Jerusalem, or (08) 974-0648, in Kiryat Sefer. Or else, visit Shatnez Testers of America, where they have lots of information about Shatnez, including Shatnez alerts, guidelines as to what needs to be checked and what doesn’t, lists of Shatnez testing labs in various countries, and more. This entry was posted in The Commandments of the Torah and tagged clothes, shatnez on 19/12/2017 by admin.